It’s hard to sleep when you’re pregnant. And the more pregnant you get, the more uncomfortable and difficult it becomes. I’m normally a great sleeper, but during my first pregnancy, it became nearly impossible. The first and third trimesters were especially brutal. I tried every possible position, but it was just not any fun. If you sleep on your back or tummy normally, you’re probably even worse off than I was! After complaining enough, my sister told me I should get a pregnancy pillow. After I looked them up, I instantly knew I had to get one. And I’m so glad I did, because it made a HUGE difference for me. The pillow I used during my pregnancy was the Leachco Snoogle body pillow (click here to check the price). And it’s absolutely awesome. I could barely sleep at all the more pregnant I got, and I’m so glad I got the Snoogle. I mean, look at the picture. Just look at it. Doesn’t it look comfortable? The only problem I had was that it’s pretty BIG. But we have a queen size bed, and it was more than enough for me, my husband, the cat and the pillow. I’m short, and I thought it might be a problem, but it really isn’t. No matter how tall you are, this pillow (which is a gift from the gods) will probably work for you. Be warned, though: it’s not very easy to change the case. Get your partner to do it for you. Trust me. Yeah, this is an expensive pillow, but I think it’s well worth it. It’s super comfortable. There are several different types of pregnancy pillows, and it will be up to you to decide which will be most comfortable. 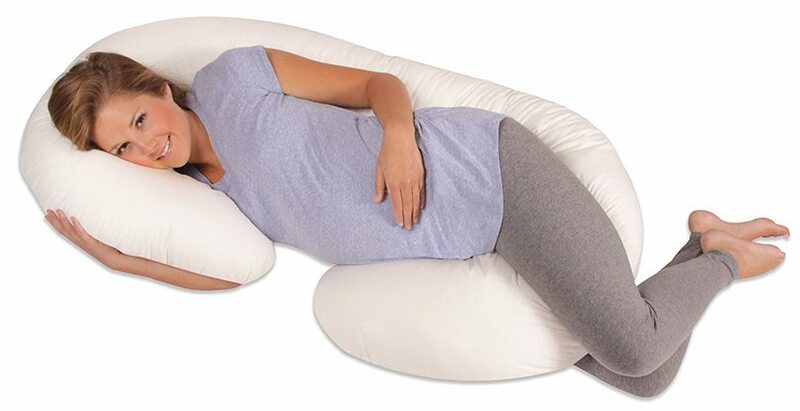 Every woman carries their weight in different places, especially when pregnant, so there’s really not going to be one best pregnancy pillow for everyone. Personally, I loved and used a full-body pillow. I think most moms will find them the best. They’re definitely the most comfy after you give birth, too! I absolutely love full-body pillows! If you prefer to sleep on your back or tummy, this is the pillow for you. They offer a full-body support, giving amazing relief from back, neck and hip pain. Most of the time you tuck them between your legs, which is not only super comfy, but is great for support. The only problem: these pillows tend to be big. Unless you have a large bed, I wouldn’t really recommend a large full-body pillow. That is, unless you’re okay with kicking your husband onto the couch at night. Which you might very well be! Another thing to note about these large pregnancy pillows is that they aren’t easy to clean — I mean, you can’t exactly throw it in the washing machine. If you’re going to go with a large, full-body pregnancy pillow, be sure to get one that has a removable and washable case. Look at that thing. You can feel the comfort from here! Full-body pillows tend to be the most expensive, so keep that in mind as well. However, since they are the most comfortable and you really can’t put a price on a good night’s sleep, you shouldn’t let a few extra dollars deter you, if you can squeeze it into your budget. For many mothers, a nice, comfortable full-body pillow is probably the best body pillow, but there are other types that might be better for you, too. Do you sleep on your side? If so, a wedge-style pillow might be for you. I personally didn’t use one of these, but basically, you’re supposed to put the pillow under your tummy while you’re on your side. You can picture it, right? It’s meant to relieve the strain your tummy puts on you. You can also place the wedge pregnancy pillow between your knees, if you wish, to help align your back, legs, and hips. They’re small enough that you can do basically whatever you need to do with them to make yourself more comfortable. Wedge pillows go under the tummy, like so. The only real downside is that these style of pillows aren’t really consistent between brands and models. There are different sizes, different angles, etc. Most of them should be comfy enough, but it’s hard to recommend a specific one. Do yourself a huge favor and get one like the Snoogle. I promise you that you won’t regret it. If you’re having back pain during the day, I’d also recommend getting yourself a belly band. They’re awesome, and you can read my guide on those right here.